In the midst of the current world turmoil, one may think that nothing sweet or innocent remains to salvage from our culture. 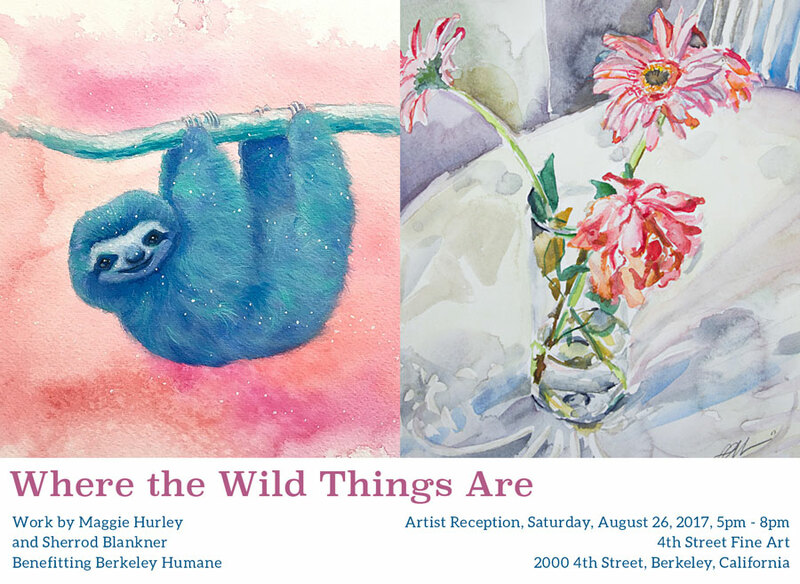 Not so, say two Berkeley watercolor artists! There is a place for the tender today. Removing the human factor from their work, these two painters present a selection of flora and fauna from a delicate, watery workspace. Where the Wild Things Are features paintings of animals and flowers, in a delicious soft palette. What is wild is invited into studio, to inspire people to remember their natural state. We will be sharing a percentage of our sales with Berkeley Humane to help protect our domestic companions in life. 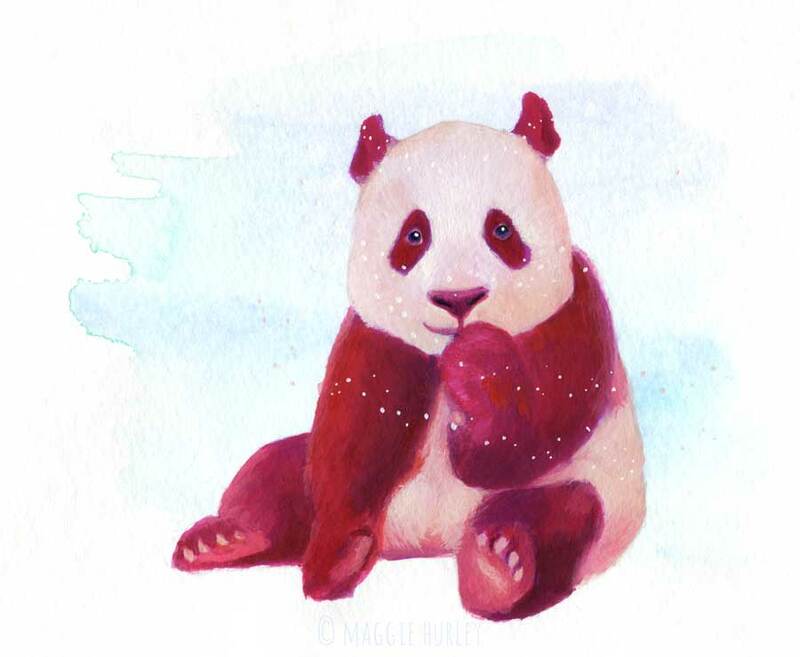 Maggie Hurley: For this exhibit, Maggie decided to explore some work on the lighter side. She pulled out her tiniest watercolor brushes to capture the textures and details of each small animal. Her palette for this series is a tribute to summer and the fantastic colors found in ice cream shops. Maggie’s delicately wrought details draw the viewers in and her sense of humor expressed through painting wins them over. Sherrod Blankner: After an intense autumn and winter painting epic scale oil portraits, Sherrod needed a break from large work. Like a hiker shrugging off a heavy pack, she slipped off the weight of oil and turned to light, gestural watercolors for the Spring. Working under the tutelage of fellow artist Debbie Claussen, Sherrod delighted in the surprise and sweetness of the medium. Many of her stand out flowers came from The Flower and the B in Rockridge Market Hall. A sweet soul, adopted Christmas Eve. Berkeley Humane: From humble beginnings in a renovated former pool hall in West Berkeley, Berkeley Humane continues to expand and adapt the services of the organization to meet the ongoing needs of the community's animals and their human guardians. Berkeley Humane's work would not be possible without its strong partnerships with local animal welfare groups and the support from animal-loving friends who share the Society's vision. Today, Berkeley Humane has thousands of supporters and volunteers, and remains steadfast in its practices to curb pet overpopulation in the East Bay and give pet guardians the tools they need to ensure that their pets remain happy and healthy in their homes for the rest of their lives. The Berkeley Humane society is located only a few blocks from 4th Street Fine Art, at 2700 Ninth Street, Berkeley, CA 94710​.